What is the role of the Artist in society? What leads the Artist to do what he does? What are the tools that help Artists to make a living on their creations? How does the Art Market behave and how can it be reached? How can creative thinking promote change and social impact? What are the challenges and opportunities faced by artists throughout their career? What’s the impact of technology in art? How is heritage managed? What is the relationship an artist’s practice has with their environment? 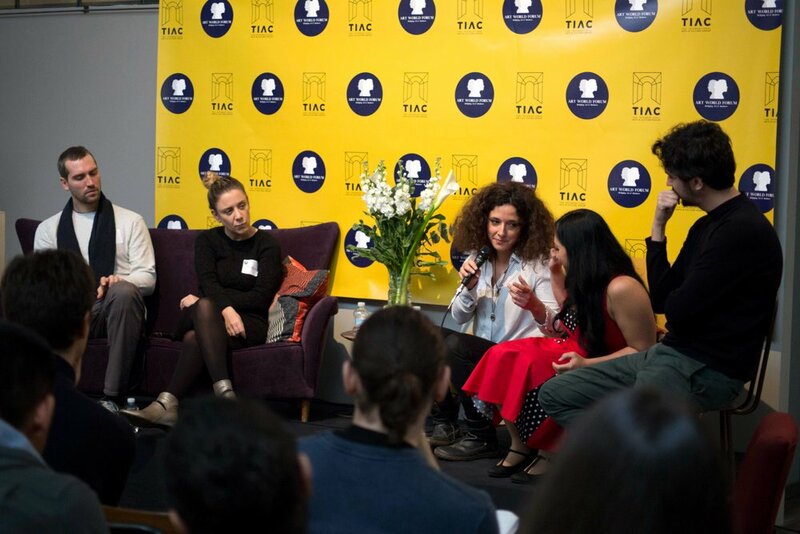 All these questions and more were faced and discussed on Saturday November 25th during the event ‘Artists take the Lead’ hosted by TIAC and organised by Art World Forum in their first Italian edition. Art World Forum is an emerging global platform created by Anni Oates and Veronica Neo, whose aim is to build valuable network between art professionals and business leaders. Through its high quality, high value international conferences, Art World Forum provides unique informational, marketing and networking opportunities to a vast number of art investors, collectors, dealers, insurers, academics, practitioners and overall art enthusiasts. Their aim is to be established in each of the world’s key art markets where transactions and investments are taking place. Through their carefully curated sessions, delegates of the conferences will have the opportunity to network with leading experts in the art-business industry from around the world, to learn about how the art market interacts with business, financial, consumer and knowledge markets, and to develop strategic alliances that may lead to business opportunities and social impact. ‘Artists Take the Lead’ was a series of conferences about artistic entrepreneurship and about The Artist as an entrepreneur himself. The event took place in The International Arts & Culture’s headquarters in Florence where at 9:30 a.m TIAC’s team welcomed the speakers and the attendants offering them a good Italian coffee. Before 10:30 a.m., all the seats were taken and it was satisfying for both TIAC and AWF to see how the room was full of people coming from a variety of backgrounds and realities of the artistic field, from students of several art academies to professional artists. Anni Oates and Veronica Neo, co-founders and directors of Art World Forum, started the event thanking TIAC and Florence for giving them the chance to organise a forum focused mainly on the Artists’s perspective, which often tends to remain on the back burner when pieces of art are treated only as economical investements to be sold and auctioned by art dealers and buyers. Right after, it was Lynn Guo and Scott Breton’s turn to speak. As TIAC’s co-founders they introduced The International Arts & Culture group as one of the projects that offer support to new artists to find an easier and clearer way of entering the artistic educational and professional world through the services they offer along with the Turandot project and Synarts, one focused on offering full education in arts and the other in charge of building an online platform to find grants, jobs, residencies and opportunities in arts all around the world. Mr. Samir Ceric followed introducing the Art Coach, a project designed to empower artists with the tool-kit and the knowledge about how to turn their passion into a long term career and guide them on their own road to success by helping them develop more, learn more, discover more, decode more, figure out more, and in that way demystifying the art industry, opening it up to a much wider audience. Mr. Ceric handed over to Armen Agop, a contemporary artist born in Cairo and currently living and working in Italy. Mr. Agop was in charge of introducing The Artist’s Perspective, bringing up the fact that the reason why human beings do art is unknown even for the Artist, who is led by a strong primary drive to create. Agop highlighted that the most precious resource for an Artist is Time. According to him, an artist must have the time to think about his project, sketch it, find the materials, work on the piece, question it and tweaking it. Though, it is well known that most of the artists are often solving financial problems by accepting jobs, sometimes not even related to art, that would give them the possibility to roughly make ends meet, but would waste their time and energy, putting them on the loop of frustration and unfulfillment of his primary drive. Mr. Agop’s statement opened up the next discussion: what are the tools an artists can use to help him to save time and have access to a market that would fairly value him and his work of art? Ms. Barbara Tagliaferri, Brand & Communication Leader, talked about how the Art Market works and underlined that social media and online communication and transactions are taking the lead on the way artists and buyers are getting connected. She introduced a very clear and detailed landscape from the buyers and art market’s point of view, but the question about what is the most successful way for an artist to access a market that seems unreachable for him, and how this numeric information could be helpful, remained without a clear answer until Miguel Mayher presented a project that links both the artistic and the financial worlds. The Artist MBA (Master in Business Administration) is a project sponsored by TIAC and created by Miguel Mayher with the aim of offering a series of online tutorials that would guide the artists on the path of entrepreneurship by finding creative ways of displaying, offering and living on their work of art, as well as promoting positive change and social impact. Mayher presented some examples of artists that would inspire people to get in touch with art by using their influence in social media. Next on the Agenda was a case of study: Thinking Outside the Box, a conversation with five artists to discuss the challenges and opportunities faced by them throughout their career, about how has the art market categorized their practice and how can new initiatives inspire change. The conversation started with a video by Anna Rosa Paladino, Burlesque Artists, presenting the contrast between the joy and beauty offered to the audience during a show, and the internal world of the artist, often painful and sad but. The video stated that being a live performance a performer’s job, no matter what, the show must go on. The ‘Thinking outside the box’ panel was composed by Mitchell Price, Artist & Teacher at The Florence Academy of Art, Tessa Moroder, Co-Founder & Textile Designer at LottoZero, Daniela Astone, Artist & Director of Second-Year at The Florence Academy of Art, Emanuele Barili, Space Designer & Architect of Associazione Chi-Na and Anna Rosa Paladino, Artist & Performer. The panel brought the attention back to the Artist’s world and to the fact that Art is not only a product to be sold, but a service to society through which it is possible to help people to find themselves, to enjoy life and to face difficult times. According to Daniela Astone, success in art can’t be measured only by the number of items sold within a year, the amount of money made with a piece or by popularity. Success is also given by the emotional impact on someone who might change behavior thanks to the contact with a work of art or the experience of art itself. Mitchell Price expressed that the worse advise that could be given to an artist is to change his lifestyle only because there could be a profit in it, therefore an artist should remain faithful to the essence that moves him to create. Tessa Moroder and Emanuele Barili encouraged the combination between arts and other disciplines, such as architecture, to create new human experiences that would serve society’s harmony and help cultural integration. Another case of study followed: Redefining the Studio, a conversation about the struggle of sourcing for an artist’s studio. How have artists taken the matter into their own hands, how have public spaces been redefined, culturally and personally and how has the cultural space been revamped were the topics to be discussed. Cosimo Balestri, Space Designer & Architect, Cristina Chiappinelli, Artist & Art-Teacher, Leonnie Buche, Musician and Alessandra Tempesti, Curator were the interviewees for this topic. The first task for this panel was to define how important it is to have a studio for an artists, and the conclusion was that the form of art defines its importance. For Cristina Chiappinelli, who often uses big printers for her graphic pieces of art, a studio is fundamental because of the need of physic space; this comes down to an increase of the artist’s expenses. On the other hand, Leonnie Buche talked about her experience in studio-sharing, that has given her the opportunity of networking and a way to widen her contacts and experiences. Cosimo Balestri exposed the possibilities of recovering abandoned places and transforming them into sustainable co-working spaces, and presented some examples of abandoned buildings being transformed into cultural spaces. After lunch the forum focused on discussing the existing models of artistic creation, restoration an preservation versus new ones. As an introduction to this topic, the art historian Andrea Foenander talked about the beginning of computer art and the development of contemporary art with the introduction of technology in it. Foenander explained that computers brought a whole new artistic field and possibilities that created a new language of expression. After the analysis of this new reality, it was the time to face and discuss the impact of the digital world on the process of art making. Scott Breton joined Ms. Foenander in the discussion, expressing how exciting it is to experiment with new media and encouraging artist to overcome their natural resistance to digital resources, which gives the artists more forgiving ways of making mistakes and experimenting. However, Breton agrees on the fact that Classicism will always be the main source of knowledge in terms of composition and narratives. Ms. Foenander added that digital world still lacks of the physical experience, which sends specific codes to the human brain trough the senses, but acknowledged that Virtual Reality is giving a whole new perspective to the experiencing of art, since it’s already being used in art installations. Breton added that VR could be a possibility to widen the experience of physical art "imagine you can walk around a sculpture with an Ipad in your hands showing you the Artist while working on his piece" he said. This part of the forum was a reminder to the artist about the ongoing and unstoppable reality of technology development and digital world, yet, the decision of using a real brush or a computer still remains in the hands of the creator, as well as its responsibility on studying the classic methods to apply them in the digital format and vice versa. The previous topic was directly connected to the next one, a conversation about the institutional paradigm when protecting the heritage. Mr. Emiliano Galiani, Director and curator of Cartasia International Biennale, Mr. Giandomenico Semeraro, Vice-Director of Accademia di Belle Arti di Firenze and Mr. Emanuele Barletti, Curator of Annigoni Museum, were the speakers analyzing how institutions are keeping up with the changing environment and how classical models are welcoming change and promoting adaptability. This last discussion brought up more questions than answers since heritage - keeping is a paradox for Emiliano Galiani, who thinks that heritage is something created continuously and renovated in the act of transmission of culture from one generation to the other, therefore it should be kept and maintained by both the government and people. Education was a strong point of discussion, for Giandomenico Semeraro the more a person studies and knows about cultural heritage, the easier it is to create awareness on the importance of its conservation. For Emanuele Barletti, art is a matter of spirit, reason why it must be honored and respected as religion, but at the same time admits that money defines the possibilities of choosing methods and frequencies of conservation processes. The discussion ended with a spontaneous participation of the audience, who suggested Art should be taught and experienced since kindergarden and at home to broaden the awareness of its role and importance in society "it is too late to create awareness in college and University, a human being needs to get in touch with art since babyhood!" shouted a lady from the audience, followed by an ovation. 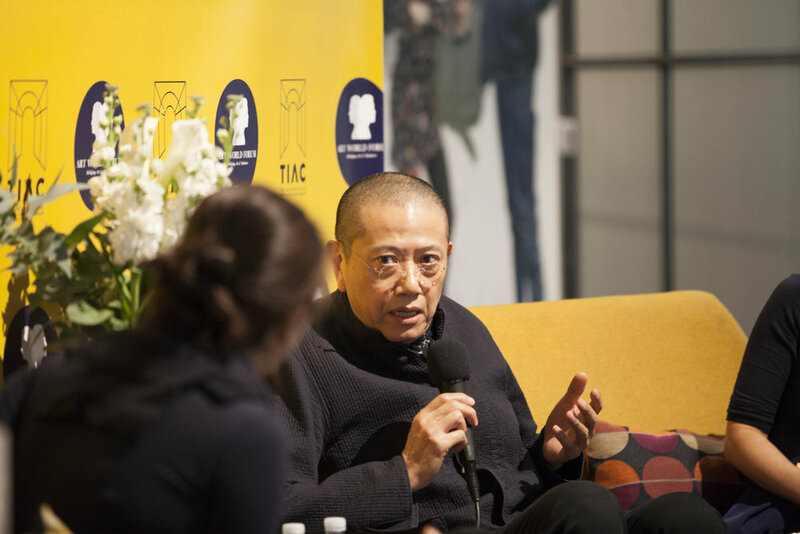 The cherry on top of the cake was the closing speech by Mr. Chen Danqing, the Art World Forum Featured Artist. With his relaxed yet serious way of speaking, Mr. Danqing words were a challenge for everyone in the room. The Master advised every artists to quit their artistic path if thoughts about money and success are defining the directions of their creation, because an artists doesn't know why he creates, but he still does it. Danqing closed the circle bringing the discussion back to what Mr. Agop said at the beginning of the day: an artist responds to a primitive drive to create and he should be the condition to have time and space to do it, so as an entrepreneur he needs the right people and tools to help him. At the end of the day, the members of Art World Forum and TIAC witnessed the success of the event when, after the closing speech by the co-founders Anni Oates and Veronica Neo, several speakers and attendants sticked around to keep on passionately talking about the topics exposed. It could definitely be said that Artists Take the Lead in Florence was a success because at the end of the day, the network was created. Will Artists Take the Lead? Definitely after the Forum it remained very clear that when an artist chooses how he wants to live and what he wants to create, he has already taken the lead.